We invested in a greenhouse this year and, at this moment in time, it’s overflowing with green garden goodies. I’ve been more of an observer than a player in the greenhouse business – I have sat back and let someone else do the hard work while enjoying the fruits (veg, mainly) of their labours. Ah well, we play to the strengths in our relationship. He grows, I invent recipes and cook. 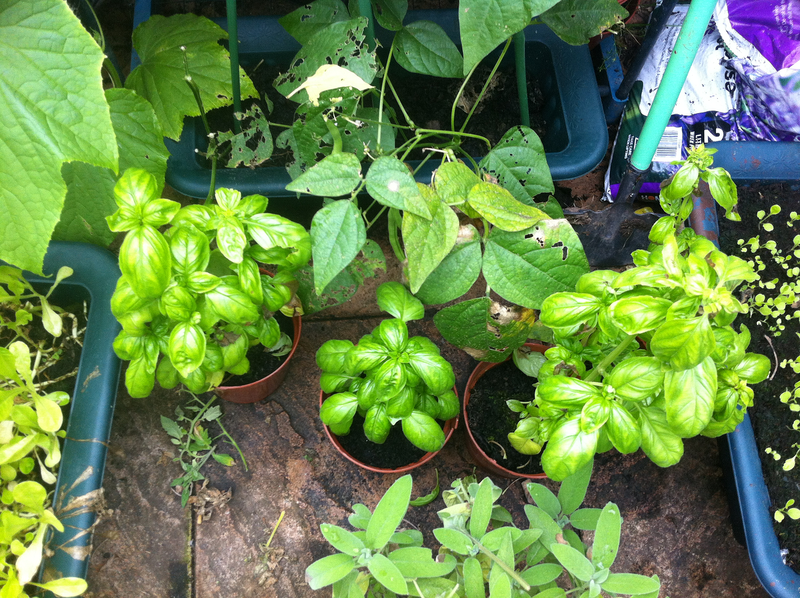 Because we had so much sunshine last month, the basil and tomatoes came on in leaps and bounds. Fitting, seeing as the two go so well together, but I’ve now got far too much basil for us to eat so I decided to turn it into home-made pesto. My version doesn’t really bother with amounts – hey, that way you get a slightly different sauce every time! – but I’ve suggested guidelines here. I use Borderfields cold-press rapeseed oil for a more home-grown feel, as well as sunflower seeds as they are TONNES cheaper than pine nuts. I also add parsley, seeing as we’ve got lots of that growing in the garden too. You can go down the traditional route and toss it with pasta, but my preferred use for pesto is on griddled vegetables as an accompaniment to roast chicken*. Put all of the ingredients (except the salt and pepper) into a blender and blend until you have a smooth-ish sauce (it’s better with a slightly granular texture). Taste, and add salt and pepper according to personal preference. *Actually, in an ideal world, I’d greedily stuff hunks of the finest freshly-made artisan bread into pesto sauce and then my gob. **To toast sunflower seeds, heat up a small frying pan and then add the seeds and turn the heat down. Shake the pan gently and toast for a minute or so. Don’t take your eye off them once OR THEY WILL BURN. Everytime I eat a friend’s home-made pesto, I remind myself to learn how to make my own. Then, I get scared that I’ll screw it up. So I don’t do it. You’ve got me interested in trying again, thank you! YUM!